Canada is an aging society; with over 13% of the population 65 and over in 2008 and with this population growing at a rate more than double the overall population. Moreover, the aging of the Canada population varies geographically across the nation. Using data drawn from the 2001 Census of Canada Master files (20% sample), the objectives of this analysis are twofold. First, the analysis examines the internal migration behavior of the older population, distinguishing between the native-born and foreign-born. Second, the analysis examines how residential attributes at the census subdivision (CSD) and census metropolitan levels influence the migration decision. This analysis examines the later-life migrations of Canada’s older population at the census subdivision level in 2001. This paper was completed while the first author was a Social and Economic Dimensions of an Aging Population (SEDAP) postdoctoral fellow at McMaster University. She gratefully acknowledges the funding support of this program and Human Resources and Social Development Canada (HRSDC) for this research. The authors would like to acknowledge assistance from Dr. Ruben Mercado with multilevel modeling in MLwiN. Browne, W. J., Rasbash, J., Ng, E. S. W. (2005). MCMC estimation in MLwiN Version 2.0. University of Bristol. http://www.cmm.bristol.ac.uk/MLwiN/download/MCMC%20est_2005.pdf. Accessed 4 March 2008. Kupiszewski, M., Schuler, M., Reichle, M., Durham, H., & Rees, Ph. (2000). Internal migration and regional population dynamics in Europe: Switzerland case study. Working Paper, School of Geography, University of Leeds. http://eprints.whiterose.ac.uk/5026/1/00-2.pdf (Last Accessed 15 April 2009). Kupiszewski, M., Illeris, S., Durham, H. & Rees, Ph. (2001a). Internal migration and regional population dynamics in Europe: Denmark case study. Working Paper, School of Geography, University of Leeds. http://eprints.whiterose.ac.uk/5018/1/01-2.pdf (Last Accessed 15 April 2009). Kupiszewski, M., Borgegard, L., Fransson, U., Hakansson, J., Durham, H. & Rees, Ph. (2001b). Internal migration and regional population dynamics in Europe: Sweden Case Study. Working Paper, School of Geography, University of Leeds. http://eprints.whiterose.ac.uk/5019/1/01-1.pdf (Last Accessed 15 April 2009). Moore, E. G., & Pacey, M. A. (2003). 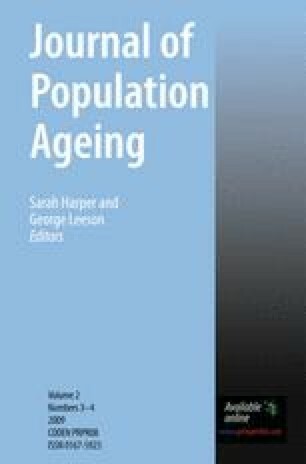 Geographical dimensions of aging in Canada 1991–2001, Research paper No. 97, Social and Economic Dimensions of an Aging Population (SEDAP), McMaster University. http://socserv2.socsci.mcmaster.ca/~sedap/p/sedap97.pdf. Accessed 10 April 2008. Moore, E. G., McGuinness, D., Pacey, M. A. & Rosenberg, M. W. (2000). Geographical dimensions of aging: the Canadian experience 1991–1996, Research paper No. 23 Social and Economic Dimensions of an Aging Population (SEDAP), McMaster University. http://socserv2.socsci.mcmaster.ca/~sedap/p/sedap23.pdf. Accessed 4 March 2008. Newbold, K. B. (2007). Return and onwards migration among older Canadians: findings from the 2001 census, Research Paper No. 171, Social and Economic Dimensions of an Aging Population (SEDAP), McMaster University. http://socserv2.socsci.mcmaster.ca/~sedap/p/sedap171.pdf. Accessed 8 March 2008. Schellenberg, G. (2004). Immigrants in Canada’s census metropolitan areas, Statistics Canada Business and Labour Market Analysis Division. Ottawa: Catalogue No. 89-613-MIE, No. 003. http://www.statcan.ca/english/research/89-613-MIE/2004003/89-613-MIE2004003.pdf. Accessed 2 April 2008.